Chocolate, Raspberries and white chocolate mousse make this a DO NOT miss! This Decadent Private Signature dessert was created "EXCLUSIVELY" for the Susan G Komen 3 Day Breast Cancer Foundation by Alaska Silk Pie Co. and the "HOT PINK RAPTORS". 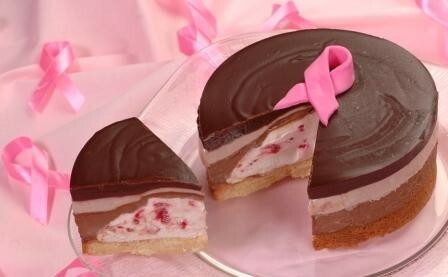 Alaska Silk Pie Co. is donating 10% of every order to the Foundation in the Fight Against Breast Cancer! What a great gift this would make for "FATHER'S DAY", or better yet, let this fabulous dessert grace your table for that special meal with family or friends anytime. A buttery shortbread crust is topped with a center of our white chocolate, raspberry silk mousse studded with whole raspberries. It is surrounded by a layer of our original, dark chocolate silk and topped with a layer of our white chocolate, raspberry silk. A finishing layer of dark chocolate ganache. The Fondant ribbon shown in the picture is "ONLY" for the picture. We found that while shipping the fondant began to leak color into the ganache and broke into pieces, so we now place a pink satin ribbon on top of the shrink wrap with every dessert. This is a dessert you will never forget, and one perhaps you have yet to experience. Order it now and help in the FIGHT AGAINST "BREAST CANCER". The ingredients in this dessert are; white chocolate, dark chocolate, semi sweet chocolate, butter, cream (dairy), pasteurized eggs, flour, raspberry puree, whole raspberries.